(CNN) -- Two British military members were killed and another four people wounded in a "serious shooting incident" at an army base in Northern Ireland, police said. 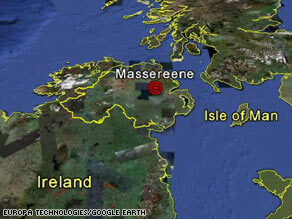 No group immediately claimed responsibility for the attack, which occurred at an army base in Massereene. The shooting happened late Saturday in Massarene, in County Antrim, one of the six counties that make up Northern Ireland. Two military personnel and two civilians were taken to a hospital in Antrim with serious injuries, a police spokeswoman said. No group immediately claimed responsibility for the attack, which occurred 200 yards away from a police station where suspected militants are believed to have been detained and questioned recently. The incident has stirred up memories of three decades of bitter sectarian fighting between Protestant loyalists to Great Britain and Irish Catholics wanting Northern Ireland to become part of the larger republic of Ireland. Eyewitnesses said pizza was being delivered when the gunmen opened fire, striking soldiers and the delivery drivers. Irish national television RTE reported that the gunmen fired shots from a passing car at about 9:40 p.m. (5:40 p.m. ET). "We haven't lost a soldier or policeman to terror in quite some time," said David Burnside, an assembly member from the loyalist Ulster Unionist Party who also represents south Antrim. "We had hoped these days were behind us." The base is home to an engineering regiment that "does a lot of work in Afghanistan," said Thomas Burns, a member of the Northern Ireland Assembly who represents south Antrim. Northern Ireland now has a power-sharing government and a prevailing peace that had been welcomed by all but radical splinter groups on both sides, thanks to the 1998 Good Friday Accord. But tensions in the region have ramped up in recent days. Earlier this week, Hugh Orde, chief constable of the Northern Ireland police, requested a British military intelligence regiment help investigate what he called increased activity among dissident republican groups. Leaders of Sinn Fein -- the former political wing of the Irish Republican Army -- warned against bringing in those troops, saying their presence would stir bad feelings among Catholics. William McCrea, a member of Parliament from the loyalist Democratic Unionist Party and a Presbyterian minister, mourned what he called "a very grievous evening." "Our soldiers are fighting in Afghanistan to defeat terrorism, but this is on our own doorstep," he said. "We can't go back to that."